In 2018 Q4, 48% of all browsing in Egypt was via smartphones, followed by 47% on desktops devices. In contrast, the United States had 40% on smartphones and 51% on desktops. Tablets in Egypt accounted for 3% of usage in 2018 Q4. The USA has considerably more browsing on tablets, with 6%. The most used smartphone in Egypt during 2018 Q4 was Huawei’s Y7 Prime with 2.7%. 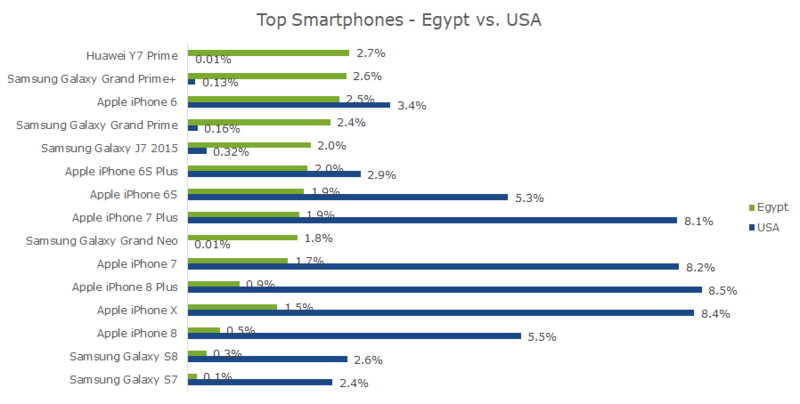 Egypt has much more fragmentation of devices, with the top 15 devices accounting for only 24.9% of usage. Apple’s new iPhones appear in the top 15 smartphones of Egypt, but the most popular iPhone is the older Apple iPhone 6 with 2.5%. 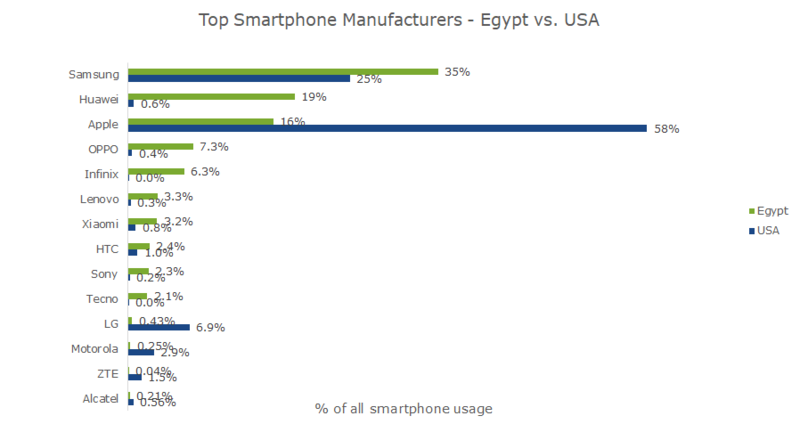 While the top phone in Egypt is from Huawei, the leading manufacturer is actually Samsung with 35% of usage. Huawei appears in second place with 19%, and Apple in third with 16%. The remainder of the manufacturers have less than 10% of usage. For more information about Egyptian mobile usage trends, including tablets, operating systems, and mobile network usage, please download the 2018 Q4 report and subscribe to the Mobile Overview Report (MOVR).